In a richly developed fictional universe, Doctor Who, a wandering survivor of a once-powerful alien civilization, possesses powers beyond human comprehension. He can bend the fabric of time and space with his TARDIS, alter the destiny of worlds, and drive entire species into extinction. The good doctor’s eleven “regenerations” and fifty years’ worth of adventures make him the longest-lived hero in science-fiction television. In The Language of Doctor Who: From Shakespeare to Alien Tongues, Jason Barr and Camille D. G. Mustachio present several essays that use language as an entry point into the character and his universe. Ranging from the original to the rebooted television series—through the adventures of the first eleven Doctors—these essays explore how written and spoken language have been used to define the Doctor’s ever-changing identities, shape his relationships with his many companions, and give him power over his enemies—even the implacable Daleks. Individual essays focus on fairy tales, myths, medical-travel narratives, nursery rhymes, and, of course, Shakespeare. 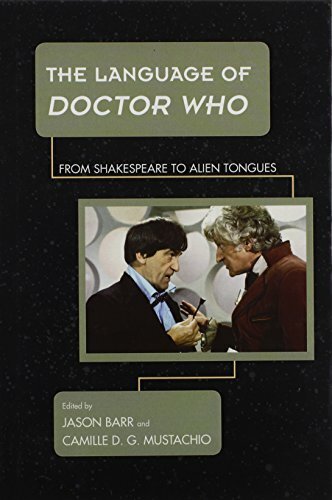 Contributors consider how the Doctor’s companions speak with him through graffiti, how the Doctor himself uses postmodern linguistics to communicate with alien species, and how language both unites and divides fans of classic Who and new Who as they try to converse with each other. Broad in scope, innovative in approach, and informed by a deep affection for the program, TheLanguage of Doctor Who will appeal to scholars of science fiction, television, and language, as well as to fans looking for a new perspective on their favorite Time Lord. If you have any questions about this product by Rowman & Littlefield Publishers, contact us by completing and submitting the form below. If you are looking for a specif part number, please include it with your message.